These are really cool. (No, really.) 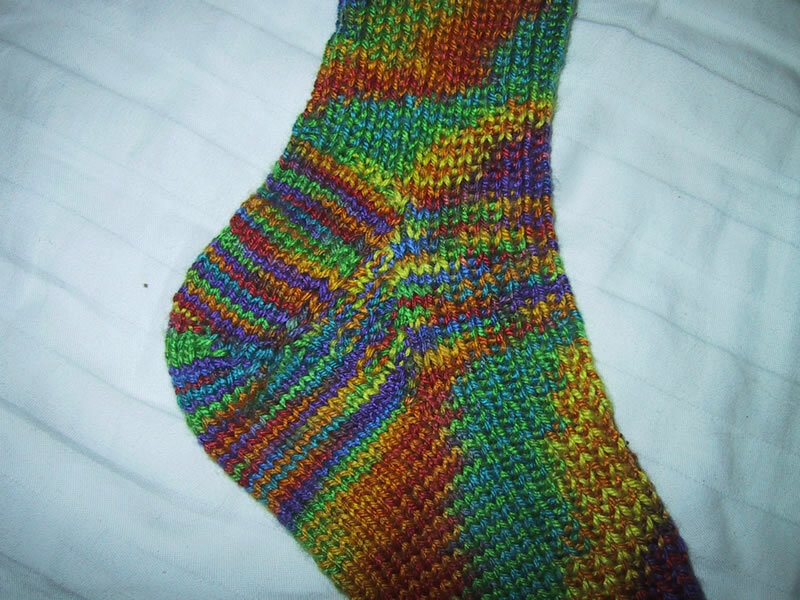 The colored stripes and moire patterns in these socks are achieved using very precise skeining and dyeing techniques. I’m quite pleased with myself for coming up with the idea, and you should really check out the full-size pictures, which look even more (!) interesting than this photo. Each “stripe”, you see, is actually two different colors…it looks a bit like a pointillist painting. I call them my Monet socks. 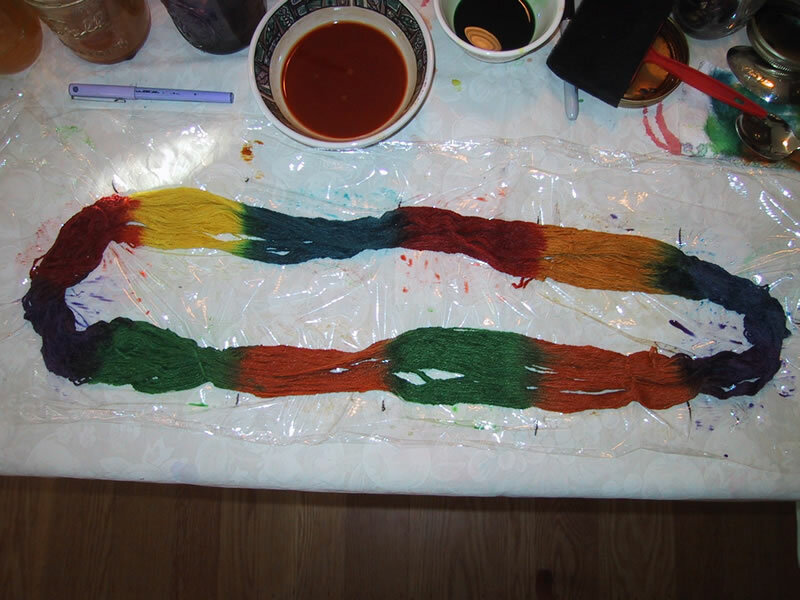 This is a pretty trick done with carefully space-dyed (handpainted) yarn. I call them “ikat socks” because they look a bit like ikat (warp-painted) fabric. This was interesting: I think I must have wound parts of the skein at different tensions. The stripes start out moving to the right of the sock (top of the photo), then drift leftward (bottom of photo). A rightward drift means the color repeats are just a little shorter than the length of a single row; a leftward drift means the color repeat is just a little longer than the length of a single row. The socks are actually pretty simple. First, you calculate the exact length of a row, by swatching the main body of the sock (knit in the round to make sure the gauge is correct). Then, if you wind a skein the exact length of a row, and space-dye it, the colors will line up as you're knitting, giving you a more-or-less vertical stripe. 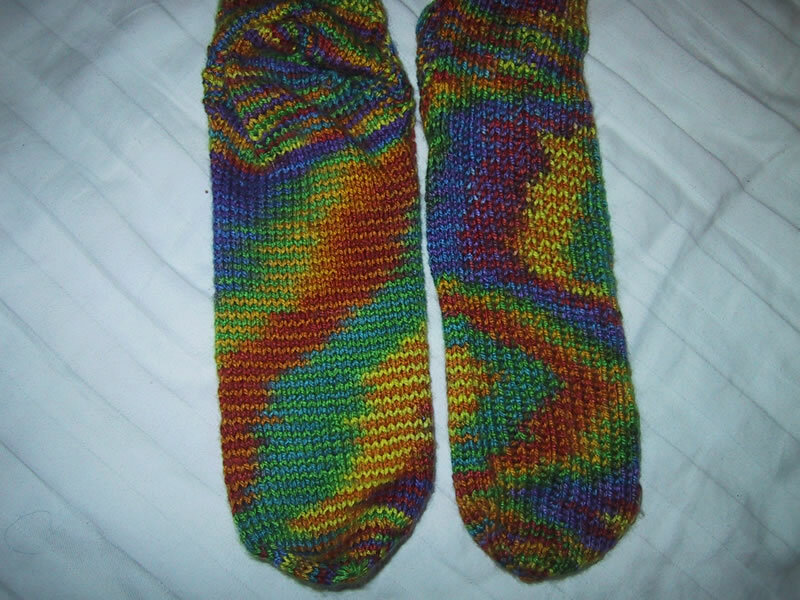 For these socks, I used a variation: I wound a skein the exact length of TWO rows, so the first six colors are knitted in the first row, the other six colors are knitted in the second row. So there are six colors that "stack" on one another, every other row. In this photo, the red on the far left stacks on the purple on the far right, the left-hand yellow stacks on the right-hand orange, the left-hand blue stacks on the green in center, and so on around the skein. This skein gives a total of six stripes: red-purple, yellow-orange, blue-green, red-orange, yellow-green, and blue-purple, in that order. If this skein were one row in length, the colors would come out in exactly the same sequence as on the skein. If you wind the skein with exactly even tension, and knit the sock with exactly even tension, just as was done on your swatch, you get vertical stripes, as in the center of this photo. 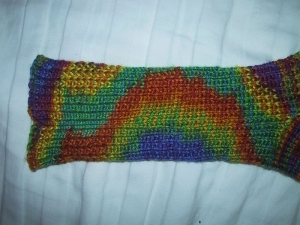 However, this is pretty rare and takes a fairly experienced knitter. It's also less interesting. When the color repeat and the row length differ by one or two stitches, as in the bottom of the swatch, you get a slowly drifting spiral with a lot more visual interest than plain verticals. 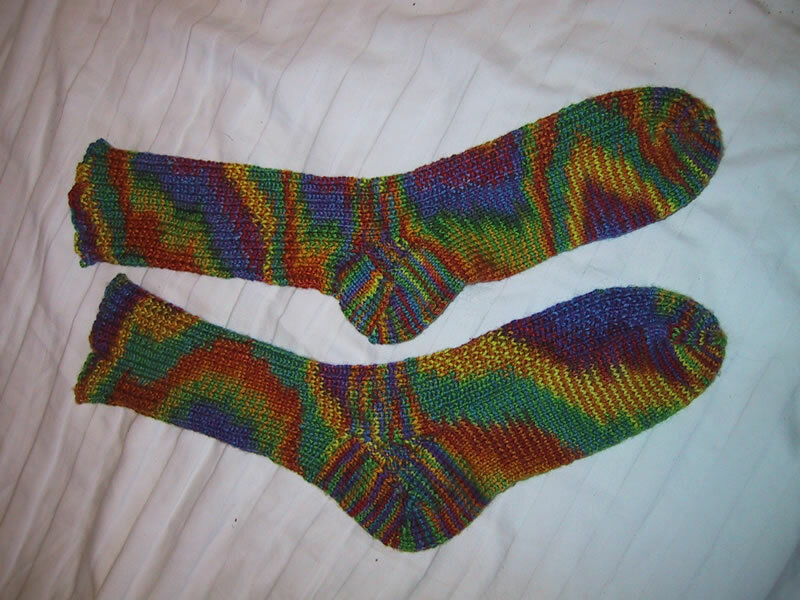 Here is one pair of finished socks, which show some of the effects you can get with this method: spirals, vertical stripes, and a moire effect. These socks also have color variations within the stripe: each vertical stripe is made up of two colors alternating, one each row. If the stitch length is too far "off", the colors don't stack properly and you get colored static, not stripes. 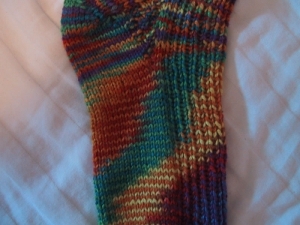 Here, in the center of the sock, the extra stitches for the gusset disrupt the pattern. It doesn't take much to do it, either--being even four or five stitches "off" will do it. If you start getting static, try increasing or decreasing a few stitches--I found I had to "fudge" the stitch count to get the stripes to line up. Finally, a look at different stitch effects. 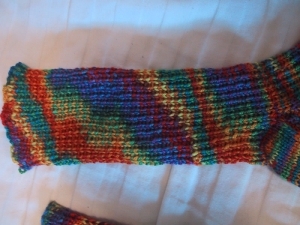 The left side is stockinette stitch, the right is 1x1 ribbing. I personally like the stockinette better--it gives a smoother effect--but of course ribbing is stretchier. 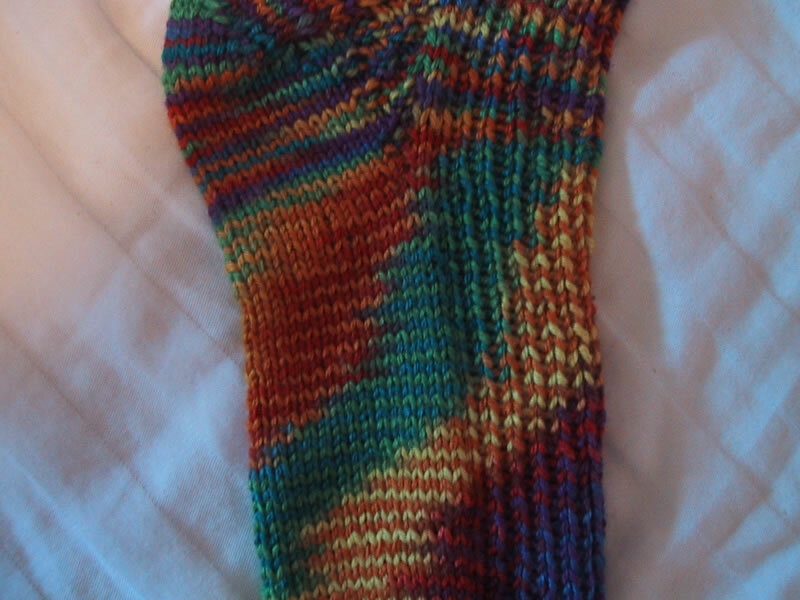 Since I made these socks out of a not-terribly-stretchy silk-wool blend, I used 1x1 ribbing for the main body. Anyway, I hope this has convinced you that space-dyed yarns can be interesting, especially in socks...I hope to knit up a couple more examples, but I really like these rainbow socks. This trick also works with sweaters, but you'll get static anywhere you have shaping. It might be interesting to combine horizontal stripes (using different colored yarns) in the shaped sections with "ikat" stripes in the unshaped sections...if you try it, send me a photo!